Tighten the bonds of your relationship by ordering online this Eye-Catching Selection of Barbie Backpack in Pink and Blue for your loved ones and give them a reason to love you more. 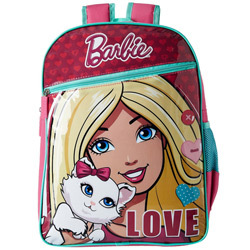 Key features of this Barbie Design School Backpack include Colorful Puller with Brand Name, Butterfly Lock, 3 Specious Compartments, made of Polyester Material, First Grade PVC Print at the Front, PVC Piping and Full Webbing, Light Weight, Easy to Carry, Side Pocket to Carry Water Bottle, Adjustable Strap and Water Resistant. (Dimension-11”/5.5”/14”).